Support from: DreadRecordings / DJ UZI / BIGNEV / SKORPZ / FARSCAPE / MADLOGIK / BREAKBEATSCIENTIST / and more..
Dj UZI - "Nice! 7/10"
BIGNEV - "Very nice roller 8/10"
Dread Recordings - "LOVE IT, GREAT VIBE 7/10"
SKORPZ - "Big tune from Hektic, dropping a different type of flava. 9/10"
FARSCAPE - "Great little atmospheric tip on this roller. Big up to the Hektic, delivering with a great drum pattern as well. 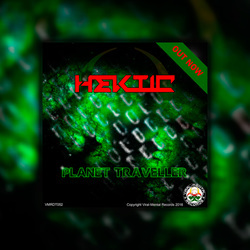 9/10"
MADLOGIK - "nice work, slightly haunting and eerie old school sound, this will deffo find it's way into a set :D 10/10"
EXIT POINT "Banging Track by Hektic 8/10"
BEAKBEATSCIENTIST - "'Planet Traveller' takes you on a journey with it's fusion of lush, spacey pads and solid breaks. Quality tune from Hektic here! 10/10"
Reson-8 - "Big up to Hektic, great sound quality and balance. And all round great DnB track!! 7/10"
TARIQ ZIYAD "quality rollin deep junglistic beats, lovin this, will support, many many thanks 10/10"